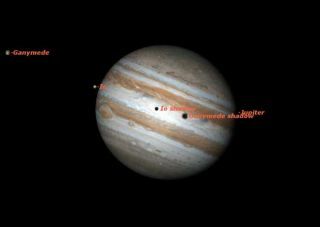 Early on Tuesday morning, June 9, two of Jupiter's moons, Io and Ganymede, will cast their shadows on the face of Jupiter. For observers on the west coast, the shadows will be followed across Jupiter by the Great Red Spot. A few weeks ago, we alerted you to an interesting event when two of Jupiter's moons cast their shadows on Jupiter's face. This Tuesday morning a similar event will occur with a slightly different cast of characters. The moons involved this time will be Io and Ganymede, and their shadows are readily visible in a good telescope with an aperture of 90 mm or more. Following the shadows across the disk will be the famous Great Red Spot of Jupiter. The Great Red Spot is the largest storm in the whole solar system. It seems to have been raging almost as long as we have had telescopes to observe it. It is an oval cyclone roughly twice the size of the entire planet Earth! Although at times in the past the Red Spot was an easy object in small telescopes, in recent years it has become a major observational challenge. At times brick red or intensely salmon in color, recently it has faded to a pale pastel shade. In fact, it has become easier to see where it isn't: what's known as the "Red Spot Hollow." The Red Spot Hollow is a gap in the South Equatorial Belt, the dark belt which dominates the southern hemisphere of Jupiter. The "not-so-red" spot sits in this gap like an egg in an eggcup. So, instead of looking for a reddish spot, look instead for a wide notch on the south side of the South Equatorial Belt. If the seeing is very steady and your telescope has excellent optics, you may be lucky enough to see a trace of color, usually a subtle salmon hue, almost like a faint glow of color. Most of the table shows the specific sequence as it unfolds on Jupiter, and these stages occur at the same time everywhere on Earth, though the local times depend on the time zone in which you are located. How much of the whole sequence you can see at any given location is governed by the local "observing window": this begins when Jupiter is 15 degrees above the horizon, high enough to be clearly seen, and ends when the Sun rises, flooding the sky with light and rendering Jupiter unobservable. These times are both somewhat variable depending on local conditions, but give a rough idea. Thus observers on the east coast will get a good view of the shadows' initial appearance, but will miss the later events involving the Red Spot because of daylight. Observers on the west coast will first see Jupiter after the shadows of both moons are already on the disk, but will have much better chance of seeing the Red Spot and the transit of Io. If they stick around a little longer, at 4:44 a.m. PDT they will see Ganymede begin its transit across Jupiter. The image accompanying this article shows a simulation with Starry Night® software of the event as it will appear at 5:15 a.m. EDT, 4:15 a.m. CDT, and 2:15 a.m. PDT on Tuesday morning, June 9. The shadows of both moons are well onto the disk, Ganymede's shadow being noticeably larger than Io's, and Io is about to begin its transit. The Great Red Spot is already visible in the Starry Night® view, but will not actually be visible in a telescope until a bit later.